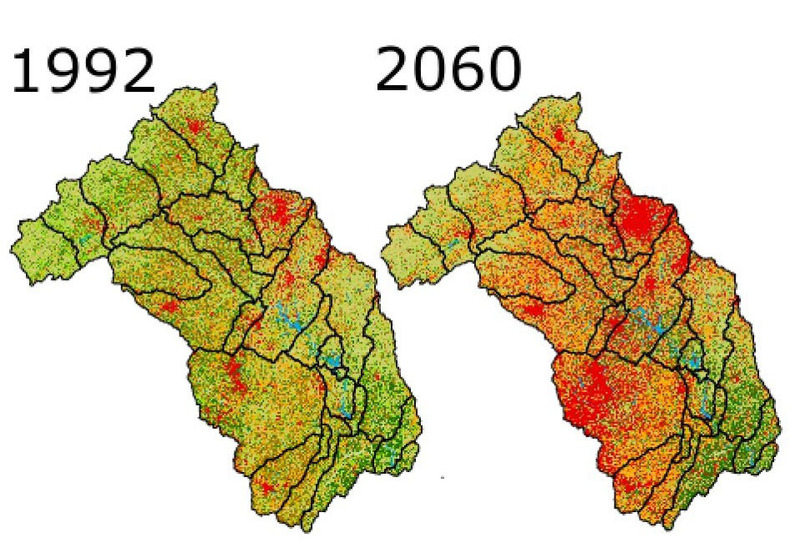 Projected changes in urban/developed areas (red), forest (green), and agricultural land uses (yellow) in the upper Yadkin Pee Dee watershed from 1992 to 2060. Note the substantial increases in urban/developed areas (red) by the year 2060. In many regions of the U.S., forests are a component of complex landscapes that also include developed and agricultural land uses. Watersheds where a high proportion of forested land will be converted to other land uses are most vulnerable to future climatic regimes, especially high stream flows. Recognizing that urban development and population growth will continue, Forest Service research can help prioritize forest areas to conserve within a watershed and serve as an important first step for informing land use planners and policy makers. The increased risk of floods due to both heavier precipitation events and increased urbanization underscores the importance of forests as hydrologic regulators. While it is clear that climate change mitigation will require substantial international cooperation, conservation of forested areas could play a large role in climate adaptation strategies at the watershed scale. In the Yadkin Pee Dee River basin in North Carolina, watersheds with a high proportion of forest area converted to developed uses will be the most vulnerable to future climatic regimes, especially high flows. More specifically, models suggest that a hotter and wetter future climate will overwhelm the ability of the forest land areas to protect against flooding during wet periods or to sustain baseflow during dry periods.